For anyone who's ever hiked it through a howling gale only to find the late shop is shut, this new Google Maps feature is a godsend. 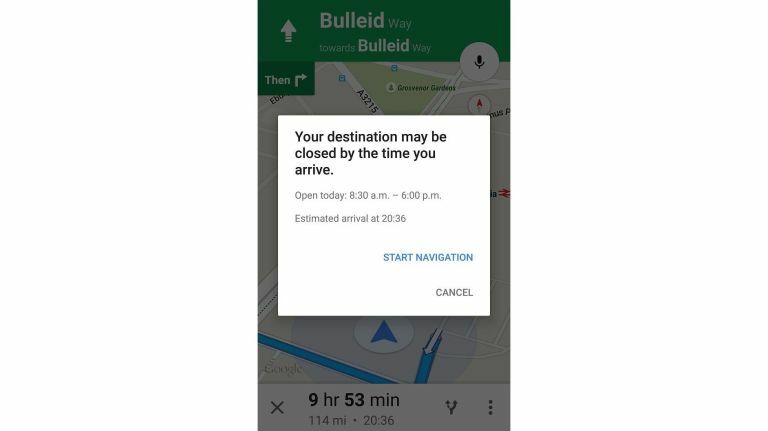 Enter your destination and mode of transport, and it will tell you if where you're going will be closed by the time you arrive. No more roaming the streets in your dressing gown, hunting for another late shop. Google Maps already featured opening hours of shops and businesses. But now it will flash up a warning that the shop will or might be closed by the time you get there. The new feature has only come to the Android version of the app at the moment. There's no word on when it will hit the iOS version. The iOS version was updated last week, so it seems Google is favouring its own mobile operating system over Apple's. As you can see from the picture accompanying this story, when you navigate to somewhere, a warning will flash up reading: "Your destination may be closed by the time you arrive". You can then choose to start navigation, or cancel. Google Maps recently added real-time transit info, so it'll tell you when the next bus is due. It was a long time coming – navigation apps like Citymapper thrive on such info. And Google Maps has only brought the info to six places in the world: San Francisco, UK, Netherlands, Budapest, Chicago and Seattle. Despite these new features, we still prefer Citymapper. That app has just been updated, and now tells you which station exit to use to best get to your destination. Amazing. Waze, meanwhile, has added Arnold Schwarzenegger's voice to its turn-by-turn directions, as part of a promotional push for the new Terminator film. Altogether now: "Get to Happy Shopper!"